In the next 30 years, there is a one-in-three chance that the Hayward fault will rupture with a 6.7 magnitude or higher earthquake, according to the United States Geologic Survey (link is external)(USGS). Such an earthquake will cause widespread damage to structures, transportation, and utilities, as well as economic and social disruption in the East Bay. 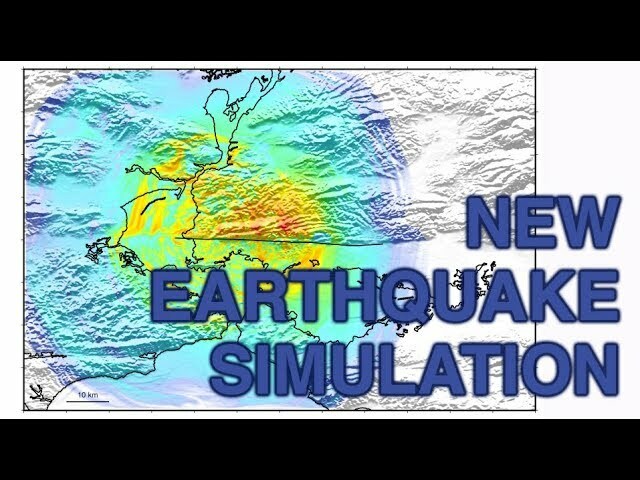 Lawrence Livermore (LLNL) and Lawrence Berkeley (link is external) (LBNL) national laboratory scientists have used some of the world’s most powerful supercomputers to model ground shaking for a magnitude (M) 7.0 earthquake on the Hayward fault and show more realistic motions than ever before. The research appears in Geophysical Research Letters (link is external). 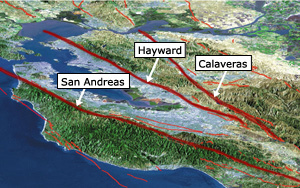 The Hayward fault is a major strike-slip fault on the eastern side of the Bay Area. This fault is capable of M 7 earthquakes and presents significant ground motion hazard to the heavily populated East Bay, including the cities of Oakland, Berkeley, Hayward, and Fremont. The last major rupture occurred in 1868 with a M 6.8-7.0 event. Instrumental observations of this earthquake were not available at the time. However, historical reports from the few thousand people who lived in the East Bay at the time indicate major damage to structures. This work is part of the DOE's Exascale Computing Project (ECP (link is external)). The ECP is focused on accelerating the delivery of a capable exascale computing ecosystem that delivers 50 times more computational science and data analytic application power than possible with DOE HPC systems such as Titan (ORNL) and Sequoia (LLNL), with the goal to launch a U.S. exascale ecosystem by 2021. The ECP is a collaborative effort of two Department of Energy organizations -- the DOE Office of Science (link is external) and the National Nuclear Security Administration (link is external). Simulations were performed using a Computing Grand Challenge allocation on the Quartz supercomputer at LLNL and with an Exascale Computing Project allocation on Cori Phase-2 at the National Energy Research Scientific Computing Center (NERSC (link is external)) at LBNL.